Hudson Yards was the location for a kick-off Summit establishing a new Digital Procurement Think Tank Community. 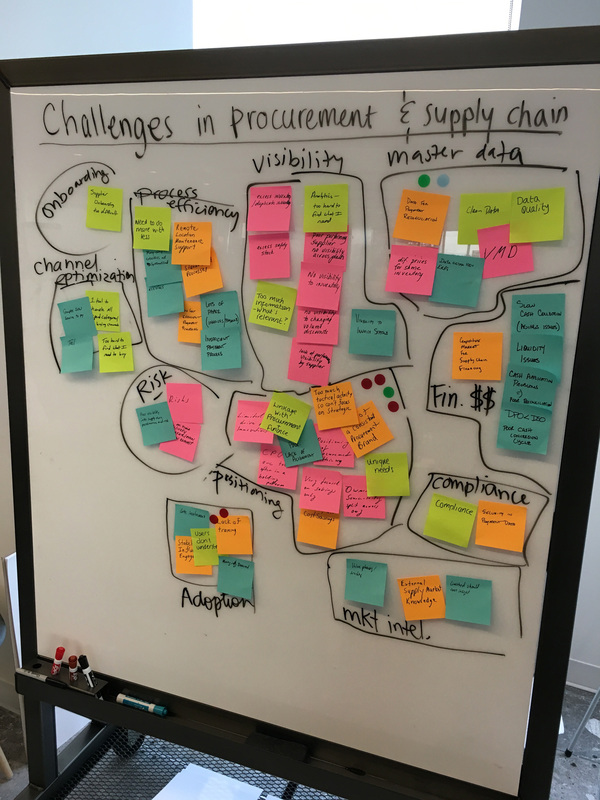 We welcomed analysts, executives, and thought leaders to brainstorm with us on the future of Procurement, and broke them out into eight teams for a Design Thinking program. I’m always hesitant to overstate things, opting for a more conservative approach. That’s why I would never say that Team Michelangelo embodied their namesake’s skill and delivered a result rivaling the majesty of the Sistine Chapel’s ceiling. Never. It’s completely true, though. Here’s the story of how this who’s who of Procurement visionaries collaborated to produce the stunning vision of CVO Rising. Assembling after a morning of thought-provoking presentations and concept demonstrations, the team got straight to work. They began by brainstorming all of the challenges they have observed in the areas of procurement and supply chain. Over sixty Post-It notes later, we had the makings of a map. Grouping common issues together, their ideas clustered into eleven distinct categories: supplier onboarding, channel optimization, process efficiency, visibility, risk, organizational positioning, adoption, market intelligence, compliance, finance, and master data. All significant challenges, but we needed to focus. Adoption: Stakeholders don’t get procurement involved early in the process when they have a need. Master Data: Out of date, duplicated, inconsistent naming conventions of vendor and product data. Positioning: Difficult to do business and help procurement to evolve/transform for the future. As we reviewed these problems and their underlying causes, a pattern emerged. There was a strong tie between how procurement was viewed in the organization (Positioning) and how well the business engaged with procurement (Adoption). The team observed that business users don’t always understand the value or role of procurement. This can be due to a strict or cumbersome process that lacks visibility, compliance, and enforcement. It can also be tied back to procurement’s history of being viewed as a purely operational function. But what is the impact? If those concerns aren’t mitigated, the business suffers. It produced friction between procurement and other functions, especially finance. It limits procurement’s ability to drive change. It makes it less likely that talented employees are interested in joining procurement. It increases risk and leads to issues downstream, with supplier proliferation and non-compliance. Most significantly, these issues lead to missed opportunities to create value for the enterprise. So what can be done? 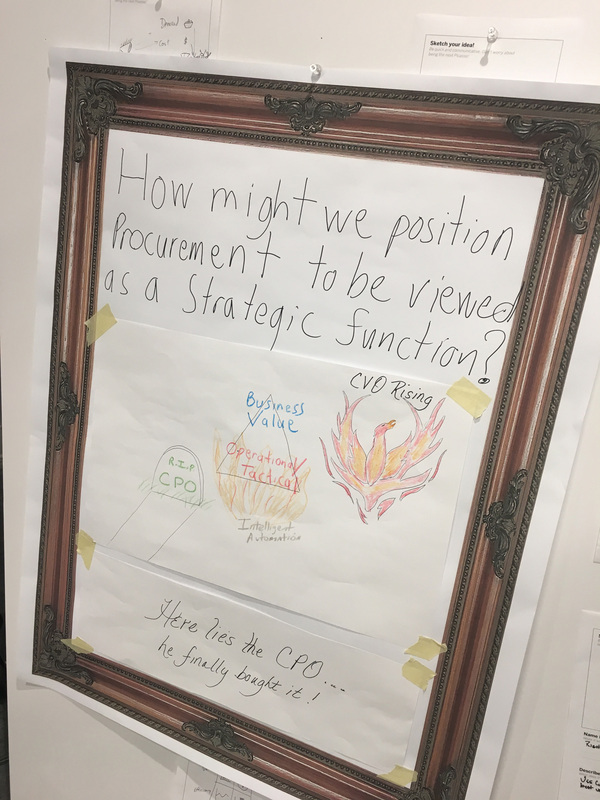 With an eye on enabling change, the facilitators posed a simple yet challenging question to the team: How might we position procurement to be viewed as a strategic function? Never shying away from a challenge, the team jumped right in, sharing ideas and building on each other’s contributions. What about talent rotation programs to cross-pollenate procurement with other business functions? What if we used AI to identify opportunities for risk mitigation or savings in real-time and presented those tasks as daily to-do reminders for employees? How about modeling corporate outcomes in a dashboard to show current performance compared to what would be possible if procurement were brought in to manage costs? With ideas flowing as swiftly as the waters of The Deluge, a core theme emerged: advanced technologies hold the promise of using intelligent automation to manage procurement’s operational and tactical tasks, freeing the CPO to focus squarely on business value. But if the CPO’s focus is no longer on the activities historically associated with procurement, is it still accurate to call her the Chief Procurement Officer? Coming together as one, the team faced an existential crisis. Who is the CPO without procurement? Aided by the surprising Renaissance-level artistry of SAP Ariba’s own Phil Beck, the team’s vision came to life. With the CPO fallen, an evolution was underway. Out of the smoldering ashes of operational procurement, laid low by the implementation of new technologies, a phoenix emerged. With value in its eyes and transformation in its heart, the majestic creature soared skyward. In that moment, the team watched in humble amazement as it witnessed a new dawn… The CVO Rising. If you’re interested in learning more about emerging technologies and their potential impact on Procurement, check out our recent paper, Intelligent Procurement from SAP Ariba. I also invite you to leave a comment below if you have an opinion on whether new technologies might allow today’s CPO to evolve into tomorrow’s CVO.